New Santa Barbara Luxury Hotels, Saying Goodbye to the Queen of Soul and Senator John McCain, A Life Without Wine, and Other Notes on a Wine Card. 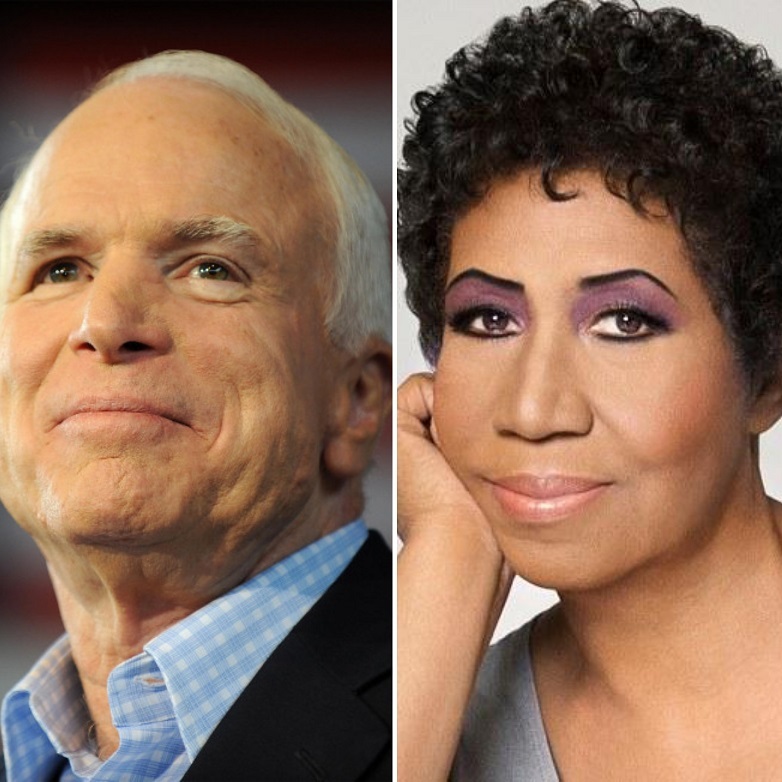 This week we are saying goodbye to two people of the utmost character, dignity, and indomitable spirit – Aretha Franklin and Senator John McCain. Although Aretha was best known for her hit “Respect,” – that proclamation for dignity that reverberated in the midst of the Civil Rights movement – I’ll always remember her for her performance at the Kennedy Center when she sang “(You Make Me Feel Like) A Natural Woman.” Such a powerful voice, such a powerful woman. I raise my glass to you Aretha. War hero, dedicated to serving others, man of character and principle – John McCain. In these challenging times dominated by those who want to build up walls instead of tearing down walls and finding common ground, John McCain will be sorely missed. By requesting that President George W. Bush and President Barack Obama give eulogies at his funeral service, Senator McCain is teaching us lessons in civility and telling us to never lose our faith in our democracy while shining a bright light on the evils of tribalism. I raise my glass to you Senator McCain. I just had one of the best tastings of French wines – and wine from any country at that – in a long long time. Aline Thiebault of Aliane Wines and her rep Jacques Rifkind stopped by and presented 10 superb wines. One of my favorites from those ten include the Xavier Reverchon Cremant du Jura Brut – an outstanding sparkling wine that drinks like high quality champagne at around $26 a bottle! It will be available at The Bottle Shop soon. Thinking of going up to Santa Barbara anytime soon? There’s been an influx of new luxury hotels in that gorgeous town recently as well as changes in management at other hotels. The Bacara Resort in Goleta has been taken over by the Ritz-Carlton management team, the Fess Parker Doubletree is now the Hilton Santa Barbara Beachfront Resort, and The Four Seasons Biltmore is back in action after being closed for five months due to the mudslides in Montecito. A new hotel to check out is The Hotel Californian, on the edge of The Funk Zone and across from Stearn’s Wharf. Lastly, I’m looking forward to The Rosewood Miramar Beach which will open later this year. It sits on the old site of the Miramar by the Sea Hotel. Word of caution though, the site is close to the train tracks and trains rumble through quite often. Sounds romantic to me and something a little champagne and caviar will help make you forget about the noise! See the LA Times article here Luxury Hotels in Santa Barbara. I must say that I noticed The Belmond El Encanto was omitted from the article. According to my thirteen year old son, The El Encanto is one of his favorite luxury hotels in Santa Barbara. No, he’s not spoiled, he just smells that way! A new study by 512 researchers was released recently and concluded that the safest level of alcohol consumption is none. Zero, nada. Being the parent of a teenager, I take special interest in this conclusion and respectfully I have to say this study is full of bull puckey. If you want to check out the study in more detail, the Washington Post has an article about Saying No to Alcohol. Congrats to the Little League baseball team from Honolulu which won the Little League World Series last weekend. Being the parent of a son who played Little League for so many years, it reminded me of how much I miss watching my boy play baseball. Win or lose, whether he got a hit or not, I truly miss watching him just play and enjoying the great game. Here’s my lineup to honor National Red Wine Day which was on Tuesday, August 28th. My question is why only one day? Everyday should be Red Wine Day! Previous Crazy 8’s, Who I’m Raising My Glass To This Week, Enter The Dragon, California’s Most Expensive Wines, and Other Notes on a Wine Card. Next The Emmy’s Official Wine, All the President’s Men, Weed Spectator, What I’m Drinking This Week, and Other Notes on a Wine Card.